Background: Clinically used antibiotics act through one of these four mechanisms: cell wall biosynthesis inhibition, inhibition of protein biosynthesis, interference with DNA and RNA synthesis and the folate pathway. Objective: The metalloenzymes carbonic anhydrases (CAs, EC 4.2.1.1) widespread in microorganisms and present as three genetically distinct families may be considered for the design of antiinfective agents with a different mechanism of action compared to the clinically used antibiotics. CAs are crucial for the life cycle of the pathogen, interfering with pH regulation and biosynthetic processes in which CO2 or bicarbonate are substrates. CA inhibition was shown to lead to debilitation or growth defects of several pathogenic bacteria. Method: CAs catalyzes the interconversion between carbon dioxide to bicarbonate, leading to the formation of protons, and thus affecting pH homeostasis. Several classes of CA inhibitors (CAIs) are known to date, among which the metal complexing anions, the unsubstituted sulfonamides, the dithiocarbamates, etc., which bind to the Zn(II) ion of the enzyme either by substituting the non-protein zinc ligand or add to the metal coordination sphere. 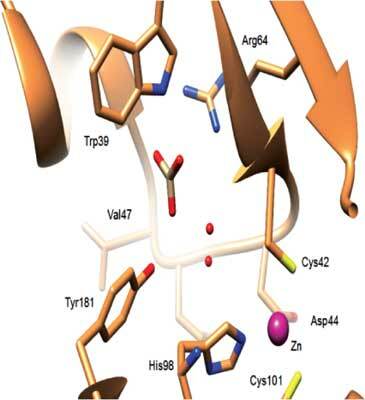 Results: Effective inhibitors for many bacterial CAs belonging to the α-, β-, and γ-CA classes were detected, some of which inhibited bacterial growth in vivo. Few of the inhibitors investigated so far were also selective for the bacterial over the human CA isoforms, which may pose problems for their wide clinical applications. Conclusion: Structure-based drug design campaigns might lead to the achievement of the desired selectivity/ potency for preferentially inhibiting bacterial but not the host CAs. Keywords: Carbonic anhydrase, Hydratase activity, Metalloenzymes, CA inhibitors, Pathogens, Selective inhibition, Antibacterial, Antiinfective, Sulfonamide, Anions, Inhibitor selectivity, Drug-design. Keywords:Carbonic anhydrase, Hydratase activity, Metalloenzymes, CA inhibitors, Pathogens, Selective inhibition, Antibacterial, Antiinfective, Sulfonamide, Anions, Inhibitor selectivity, Drug-design. Abstract:Background: Clinically used antibiotics act through one of these four mechanisms: cell wall biosynthesis inhibition, inhibition of protein biosynthesis, interference with DNA and RNA synthesis and the folate pathway.